It has been quite a long time since I posted. I'll be sure to share some health and nutritional garden recipes and tips soon, but first I'd like to start back by mentioning my favorite story that has been unfolding in our lives ~ Tango the Garden Cat. Tango is a three part story for all ages to enjoy reading. The series was published on Dave's Gardens international website. The story was written with a fictional twist, however it is based on a true story. Tango is a real, small and sweet, feral cat that arrived in our garden. And as it turned out, he had feral friends! The fantastic artwork was created just for this story by a wonderful and talented color pencil artist, Carol Moore. Please thank Carol for her support of feral cats by visiting her web site. 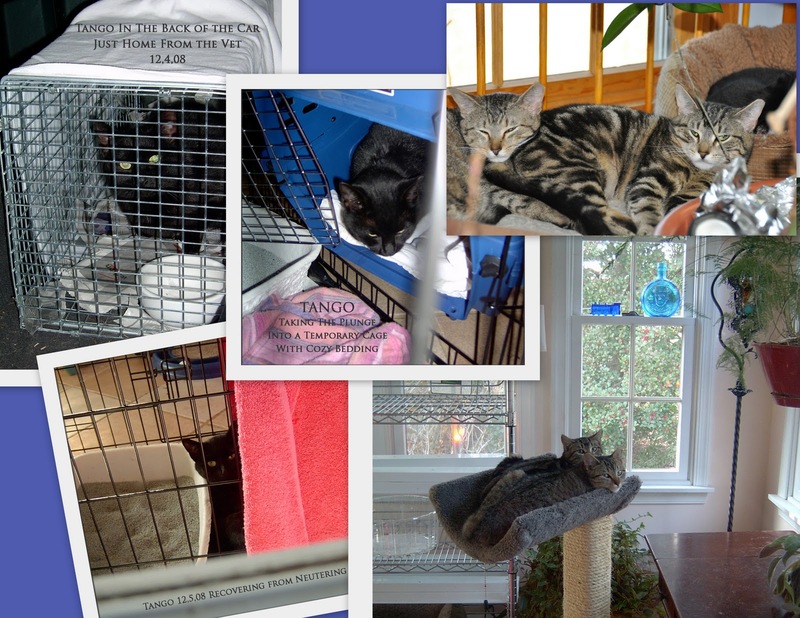 You too can make a difference in the lives of feral cats, like Tango, by supporting organizations that help feral cats. Or even better yet -- so long as you're not expecting a lap cat -- maybe you can adopt and directly help out and save the lives of a feral cat (or two or three!) -- they would be forever grateful. Note: update 1/5/2019: sorry, it appears that the story links are no longer active. The online Tango story was eventually deleted by Dave's Gardens new owners. Of course, we love the story and may rewrite it in a children's story book someday. Tango is still alive with his sisters and living comfortably indoors. Photo collage copyright ©2011 Wind. Tango, the Garden Cat is a trademark of Feral Gardens. All rights reserved.